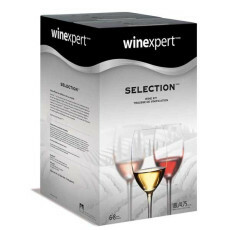 The Selection series from Winexpert, represents their most popular line. These wine kits are for those who demand wines with exceptional body, flavor, and aroma. With over 20 premium wine kits to choose from, you'll be able to find that perfect accompaniment for every occasion. The intense fruitiness of this beguiling wine suggests rich sweetness, but it shows a surprisingly dry and aromatic finish. A traditional Winexpert favourite. The combination of these two exceptional varieties with the oak additive gives a depth of complexity and character. Made famous in Italy's Piedmont region - highly regarded for its finest wines - this Nebbiolo is rich in flavor and deep in color, with a rounded oak aroma that lingers on the finish. The noble California red grape. Rich in tannis, it produces a deep, full-bodied wine with intense aroma and flavour. The name was endowed by a wine scientist who tasted one of the first finished wines made from the new grape and declared that it showed "a Symphony of aromas and flavours." Cabernet Sauvignons structural intensity perfectly complements the ripe fruit and chocolate flavors of Shiraz, for rich, complex and hearty red wine of outstanding character. Montepulciano is a vigorous red grape variety widely planted over much of east-central Italy, capableof creating deeply coloured, rich red wines with blackberry fruit flavours and spicy, peppery tannin levels. A delicate wine with aromas of violet and luscious red fruit characteristics of cherry, strawberry and raspberry.